Not more than a further half hour out from London on a pilgrimage to Sissinghurst Castle brings you to another not-to-be-missed garden. 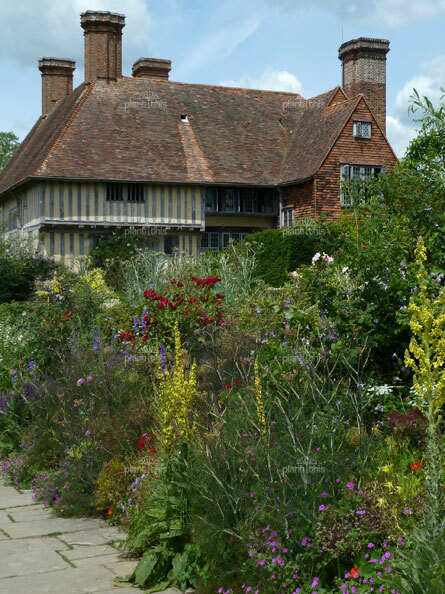 Like Sissinghurst, Great Dixter has passed from the previous care of renowned garden makers. But whereas the grand manor of Vita Sackville-West and Sir Harold Nicolson has long been in the institutional hands of the National Trust, the garden substantially laid out by Edwin Lutyens just before WWI – without his sometimes collaborator, Gertrude Jekyll – and owned by colourful English garden writer Christopher Lloyd until his death in 2006 retains a bold and casual character in the hands of its new carers. Lloyd’s was a well-to-do family and their house and garden are not built on what could be called a standard cottage garden scale. But the Arts & Crafts style practised by Lutyens – and Jekyll – and reflected here in both house and garden – transforms what could be a visit to an imposing property and outdoor museum into a homely experience that feels like being in somebody’s real, lived-in garden. It’s a style that to some extent spurns style. For architecture, Arts & Crafts was preoccupied more with being true to and using local materials, skills and traditions; an idea coming around again in a lower carbon-footprint 21st century. In reaction to the haughty landscape statements of Victorian carpet-bedding displays accompanying grand houses, more modest Arts & Crafts buildings were harmonised with naturalistic gardens of richly varied and wild plantings. Or wild-ish. Formal elements like hedges, parterres and topiary have their place along with terraces, urns and statues. 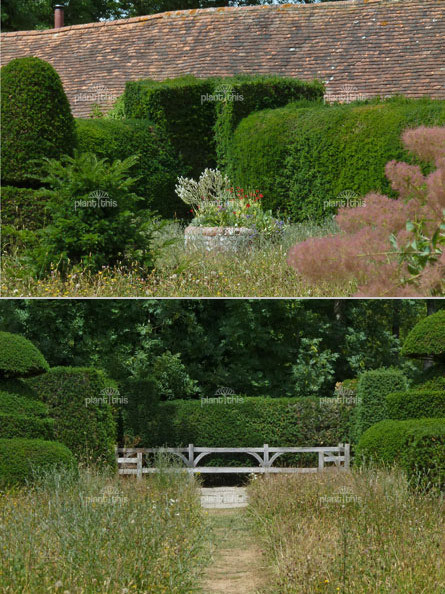 Lutyens laid out and Lloyd’s father, Nathaniel, planted and grew miles of the yew hedges (sometimes holly oak) that divide Great Dixter’s various garden rooms and provide their trim walls as a clean, dark backdrop. The yew is stepped, curved and angled. And though two of the gardens are even dedicated to topiary, the effect is more fun than formal. One is populated with peacock shapes – a ‘parliament of birds’ – among riotous borders. The other Topiary Lawn in fact has meadow rather than turf growing between the hedges, trimmed shapes and flagstone paths in a striking blend of formal and informal. The entry room to the front door is a dedicated Meadow Garden: a place where Lloyd’s mother, Daisy, brought the countryside – plus the odd alien plant – in. Different little species bulbs and orchids push up over the season through a mix of vetch, trefoil and grass. The whole area is cut back in summer and late autumn and the material composted elsewhere so the soil isn’t enriched and overrun with coarser plants. Cultivating a version of the local natural environment – not just the plant species but the structure of their vegetation communities – is a lesson in sensible plant selection and a path to developing a vernacular style of garden with a sense of and connection to its own place. It’s also a purist interpretation of the usual Arts and Crafts notion of a naturalistic garden. Inspired by the luxuriant jungle mix of colour and foliage texture of more tropical gardens, its promotion by the likes of William Robinson and Gertrude Jekyll precipitated what most of us now think of as the quintessential romantic and picturesque English border. 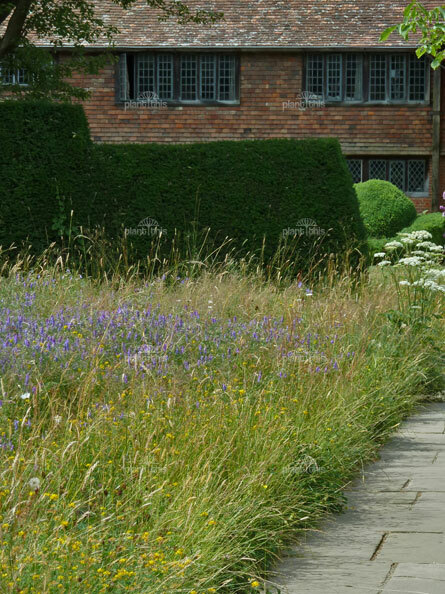 And there is plenty of it at Great Dixter, including … the Long Border. Over 100m of flagstone paving to stroll past a dazzling succession of exuberant, rambling, layered, high maintenance planting. They’re not traditional herbaceous borders – only of perennials that disappear with the cold – but mixed borders including shrubs that persist through winter. Bright tulips, daffodils and alliums push through clumps of yarrow, geraniums and poppies that fill out and spill into golden spiraea, dwarf bamboo and each other. Valerian and borage are encouraged to self-seed where they please – but are patrolled. 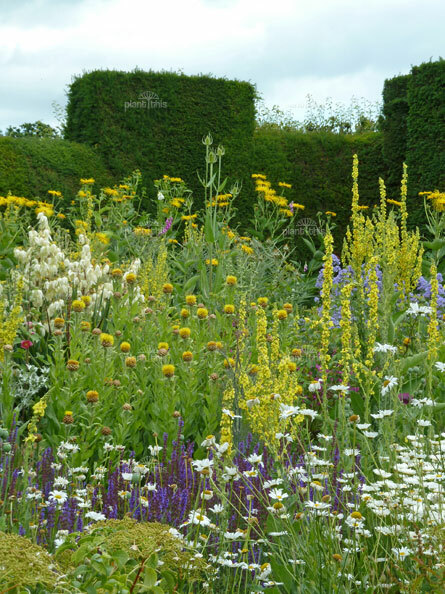 Tall plants like mullein, fennel and teasel with open, translucent forms are allowed at the front of a border. It’s natural-istic. Like nature, yet not. The meadows and borders are of course substantially and carefully contrived, planted and managed into vignettes. Another of Lloyd’s departures from convention was his advocacy and use of bold colours and brassy foliage that more refined and timid English tastes might deem ‘vulgar’. It’s an approach that also sits well with the Australian ethos and our harsher light. It’s all hot dahlias, variegated cannas, and saturated montbretias; but cut with mauve-purple-blues of lupins, delphiniums and sages. There’s hardly a space for a blushing English rose. In fact a formal rose garden designed by Lutyens has been transformed into the Exotic Garden where less cold hardy and slower plants hit their peak in later summer and autumn. Exotic for some, but perhaps not a highlight for those from warmer climates who might be bemused by other visitors’ eagerness to be photographed with the banana plants.